If you need new pickup trucks over the next 12 months, factory order them NOW. Demand for new light and heavy duty pickup trucks has exceeded supply and we anticipate the situation will get worse before it gets better. 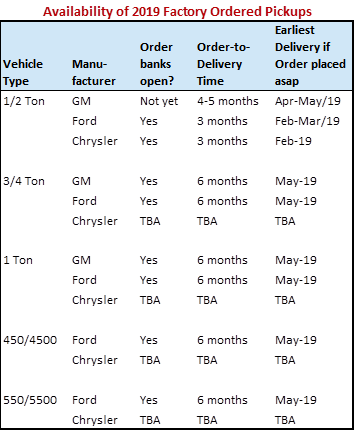 Vehicle manufacturer 2019 model year order banks are filling up. Once full, there will be a scramble for new trucks on dealer lots, and if available, they will fetch a pretty price. First of all, the strong U.S. economy has spurred demand for commercial trucks, prompting truck manufacturers to focus on increasing production for the U.S. market. At the same time, General Motors and Chrysler are making body style and model changes, and Ford is experiencing a parts shortage for its heavy-duty lineup. Since dealer stock orders will not be a reliable option, it has become critical to anticipate truck requirements and place factory orders now, utilizing the deferred delivery option if needed. That way, you will get your 2019 truck orders in the order banks before they are built out.